﻿NetAprendizagem: A Internet na Educação﻿ (NetLearning: The Internet in Education), my Master's thesis turned book, was published by Porto Editora in 1998. It was a pioneer work in Portugal in the words of Professor António Dias de Figueiredo from Coimbra University, in the Preface. NetAprendizagem was most probably ahead of its time in the sense that teachers weren't yet really embracing educational technology. It was taken out of print in 2006. A couple of years later I asked Porto Editora if they'd give me a file of the book and allow me to include it for free in my website. It was granted. As a very proud member of the Porto Editora Family, it is with great pleasure that I make it available in this website today (17 Jun. 2014). Click the book cover for the "free" .pdf version. 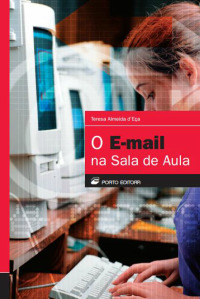 O Email na Sala de Aula (Email in the Classroom) describes different types of email projects at different grade levels and disciplines. Quite a few of the ideas are still doable today and can be adapted to Web-based communication tools. This book is the result of a sabbatical that I got from the Portuguese Ministry of Education for the 2000-2001 school year. It came out in Dec. 2002 and, once again, Prof. Dias de Figueiredo considered it a pioneer work in Portugal. It was taken out of print a few years ago by Porto Editora, who then gave me permission to include it in my website. It is with great pleasure that I make it available in this website today (18 Jun. 2014). Click the book cover for the "free" .pdf version. I researched and wrote Algumas Considerações sobre a Problemática do Erro na Produção Oral e Escrita do Inglês in 1995, because I was interested in exploring slips, mistakes and errors in oral and written English. This is the end product that I thought of publishing, but never did. Self-publishing was unheard of back then and a few months later I entered my Master's program. I had no time except for teaching and studying. I made this publication available in my website several years ago and in Oct. 2010 I published it in ISSUU. You have the embedded version on the left. If you prefer the direct link, click here.